James Jean, awe-inspiring cover artist for the Fables series from Vertigo, will be in Manila from November 20-23, courtesy of Fully Booked. Fully Booked has a page set-up with a schedule of events for (and leading up to) Jean’s visit, and you can check it out here. Of special interest is a contest (well, basically a raffle) that Fully Booked is running along with UNO Magazine–basically just leave a comment on the UNO Blog (somewhat NSFW of course) here answering the question “Which is your favorite James Jean masterpiece and why?” As of right now there are 52 comments, so those are still decent odds. Deadline for entries is November 18, 11:59, so post soon if you’re interested. Lord knows I am… if I ever get to be President of the Philippines, I’m flying him back here to do my official portrait. Will post James Jean’s schedule and guidelines (from the Fully Booked site) after the jump, for your reference. Note that the talk at La Salle Benilde seems to require reserving a slot via email, and that registration is also required prior to the signing events. 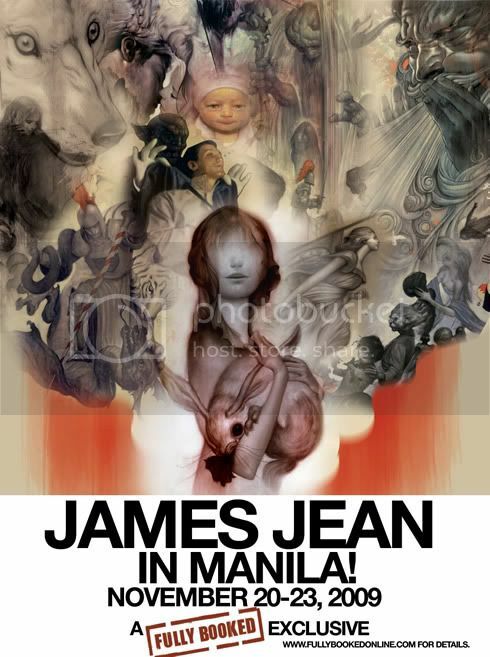 Customers who want to have items signed by James Jean need to register before the event. Registration starts at 10AM on the book signing day. Customers can have a maximum of 4 items at a time signed. Of the 4 items, 2 should have been purchased from Fully Booked. Customers can present an original receipt or an item with a Fully Booked price tag. After inspection of items, the customer will be given a numbered stub. DO NOT LOSE THE STUB. If the customer loses the stub, he will have to register again for a new number. Customers may fall in line right away or wait for their stub numbers to be called. The start of the book signing will be announced ten minutes beforehand to give customers time to line up. If a customer is not present when his/her number is up, he/she forfeits his/her place and has to line up for a new number. Customers will be asked to print their name legibly on a sheet of paper to facilititate quicker book signing. Customers with more than 4 items to be signed can register for a new number once their first 4 items are signed. to reserve a slot. RSVP by November 18. Hurry, only waiting-list slots left.